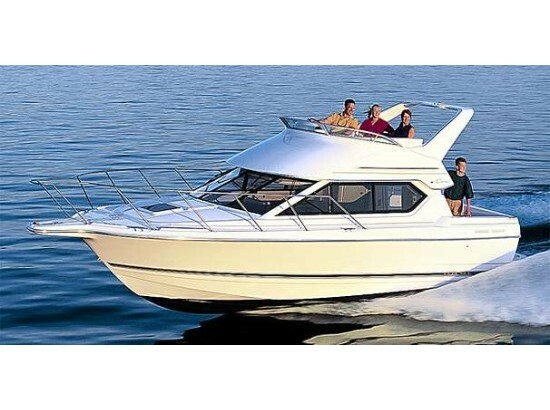 1997 Bayliner 2858 Ciera Command Bridge Spacious and comfortable, the Bayliner 2858 Ciera Command Bridge is designed around a single engine to efficiently and economically deliver performance. Upper and lower helm stations allow comfortable cruising in any weather.Large Cabin Windows All Around provide a light & airy interior, Excellent Headroom adds considerably to the sense of a large space. 1998 Bayliner 2858 Ciera Command Bridge Very clean Bayliner 2858 stored indoors on a trailer, 7.4 Mercruiser with Bravo II outdrive, fresh water cooling, Radar, GPS, VHF, trim tabs, bait bag, fridge, bimini top, stereos top and bottom, hot water heater, microwave, must see to appreciate, available with or without trailer, available for $32,900 at Boat Sellers. Add $3000 for trailer. Spacious and comfortable, the Bayliner 2858 Ciera Command Bridge is designed around a single powerplant to efficiently and economically deliver performance. Upper and lower helm stations allow comfortable cruising in any weather. Accommodations include a large forward berth and private midship compartment with double berth. The 2858 features an all-electric galley, enclosed head with shower, vanity mirror, and marine toilet for optimum livability. 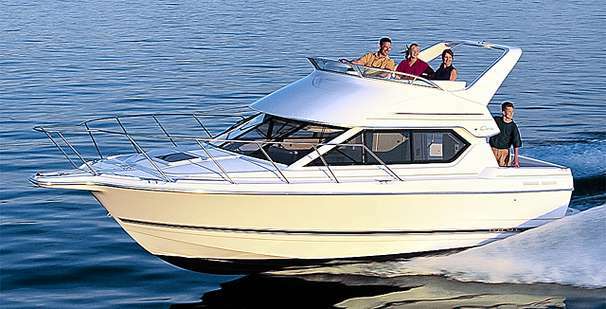 Every Bayliner is designed and built to meet or exceed all applicable standards of the US. Coast Guard, and every one carries the certification seal of the National Marine Manufacturers Association. Everything from gelcoats to carpeting is subjected to extreme climate exposure and stress testing far beyond the limits of normal use. The biggest test comes when the hull meets the water the prototypes are put through grueling performance, handling, and endurance trials. Hull strength, ride characteristics, fuel efficiency, engine performance, and more are all scientifically evaluated. Bayliner seals the transom opening during the lay-up process. Most builders simply cut an opening through the transom of a completed hull, exposing stiffening end grain and inviting decay. No exposed wood means longer hull life. 1998 Bayliner 2858 Ciera Command Bridge (LOCATION: Jacksonville FL) The Bayliner 2858 Ciera Command Bridge features traditional cruiser style and family accommodations. She has an open flybridge for wind-in-your-face cruising, a lower enclosed helm, open cockpit with ample room and a mid-cabin interior with double berth, v-berth, and convertible dinette. 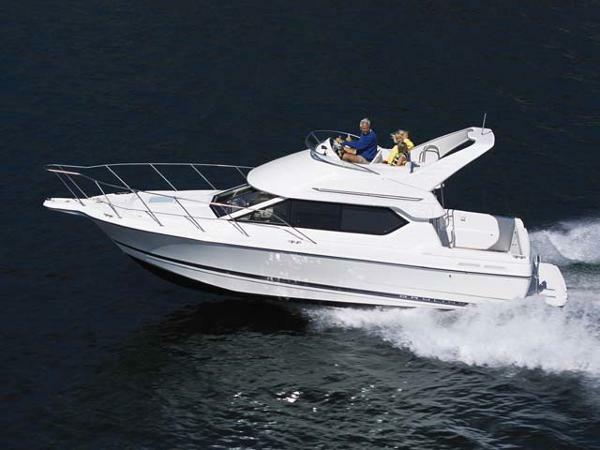 Whether you are planning a day on water or a weekend getaway this family cruiser can easily accommodate.Overhead is a roomy flybridge with radar arch, bimini top, seating for four, and an upper station with captain’s chair. On deck we have a bow pulpit with roller and anchor, tall stainless steel bow rail, and a spacious cockpit with room to relax, entertain, or dine. A transom door offers easy access to the swim platform. A center entry takes you into the salonInside we find an air-conditioned salon with port side convertible dinette, galley starboard, lower helm station, forward v-berth, and mid-cabin double berth. There is a full galley with solid surface counter, stainless steel sink, two-burner alcohol / electric stove, microwave oven, and a refrigerator with ice maker. The enclosed head is aft to starboard and includes vanity with sink and shower.This 28' cruiser is powered by a MerCruiser 310-hp engine with Bravo outdrive that provides dependable performance. 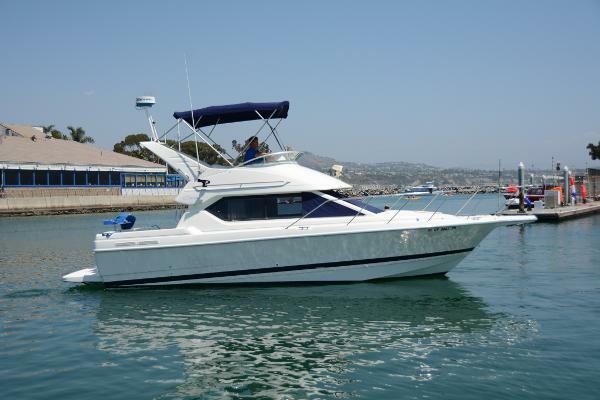 You will find her small enough for easy handling and large enough to cruise in comfort. She is well-equipped, carefully maintained, and is ready to cruise. 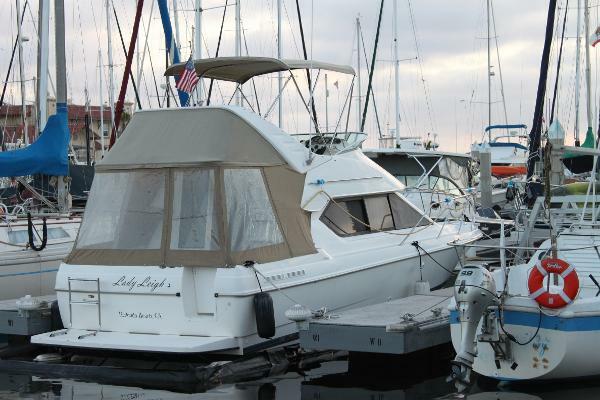 Call now for more information and to schedule a showing of this affordable family flybridge cruiser. Seller says BRING OFFERS! 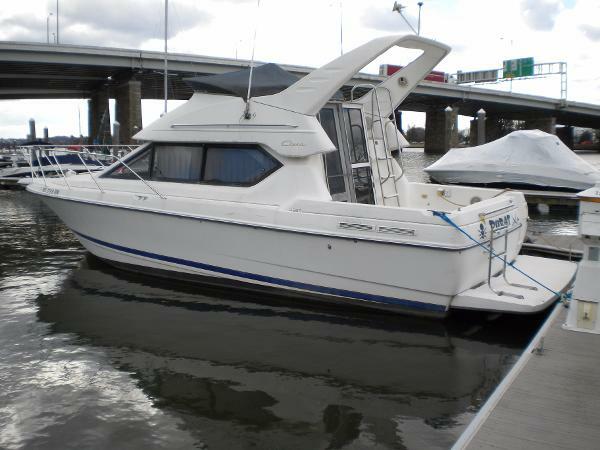 1994 Bayliner 2858 Ciera Command Bridge Sporty flybridge cruiser is versatile, roomy, and inexpensive to operate. 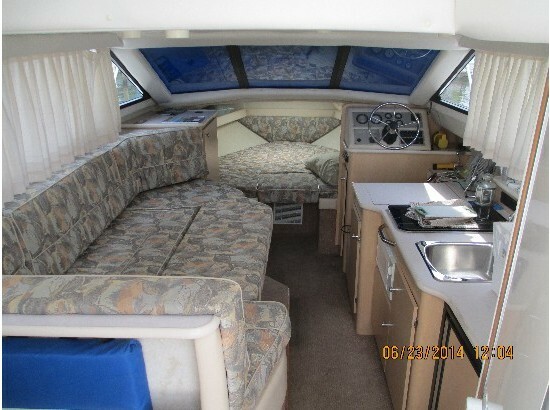 Impressive accomodations for a 28-footer allow it to be spacious and comfortable. The Bayliner 2858 Command Bridge is designed around a single powerplant to efficiently and economically deliver performance, and upper and lower helm stations allow comfortable cruising in any weather. 2001 Bayliner 2858 Ciera Command Bridge 28' Bayliner 2858 Ciera Command Bridge - A great looking family cruiser with a surprisingly large and complete interior. The floor plan includes a private mid-cabin berth below the raised salon settee as well as V-berths forward. A freshwater boat until 9/2012. NEW Bravo III outdrive, NEW Garmin 740S GPS/Fishfinder. Armored Hull bottom liner alleviates need for bottom cleaning. Outdrive serviced September 2015. Full camper enclosure. Shift cable replaced September 2015. NEW transom shower, fresh water. Slip available with marina management approval. Please contact our office for more information and an appointment to see this boat. 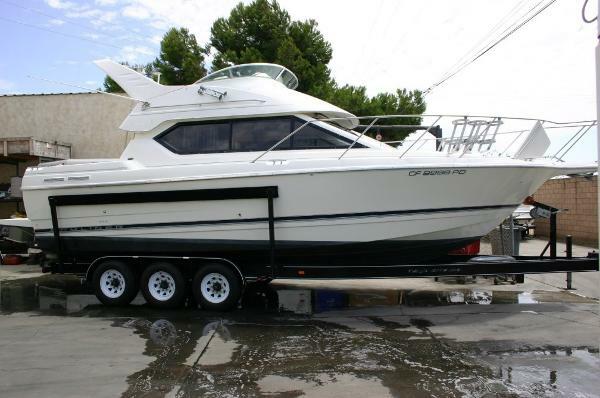 2000 Bayliner 2858 Ciera Command Bridge BAYLINER 2858 + TRAILER boat bayliner 2858 Mercruiser 454 7.4 litros /gas / 2000 Fuel 113 gallons, water capacity 30 gallons, weight 8090 libras, beam 9'10" , draft 3'2", loa 28' anchor with remote, bravo III outdrive, generator kohler with under 178 hours 5000 watt, trucharge battery charger, digital depth sounder, sleeping 6 person, full carpet, macerator system, full head and shower, norcold tek ll 12 volt/110 volt refrigerator/ freezer, origo microwave, origo 2 burner stovetop, trailer triple axle load ride included, full canvas. FINANCING AVAILABLE!! !